The Edge of Will: More Hearth-Melting! 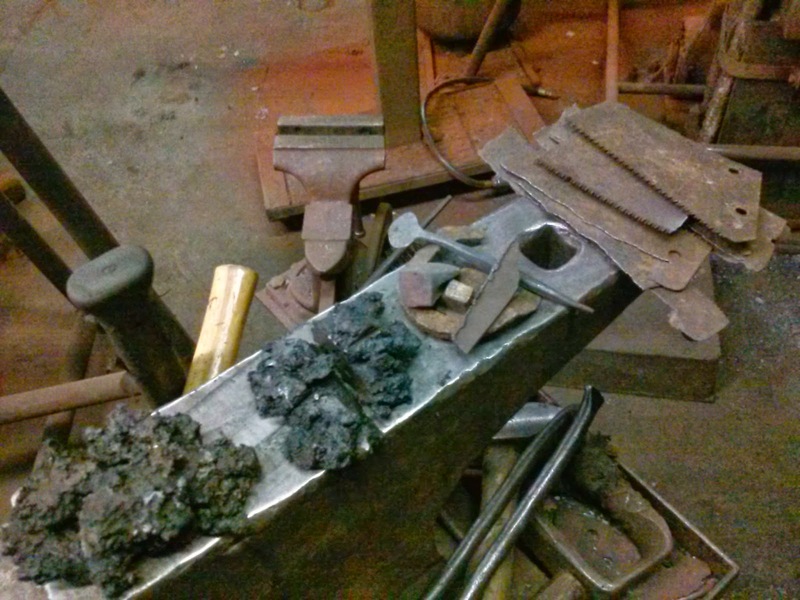 A few weeks ago, I did another round of hearth-melting at my friend Jack McAuliffe's shop in Worcester, MA. He's definitely got this process down by now, having produced a number of daring and incredibly advanced Roman blades of various periods out of this character-rich iron of unparalleled complexity and historicity. For those who don't know, hearth-melting is basically iron-age steel recycling. 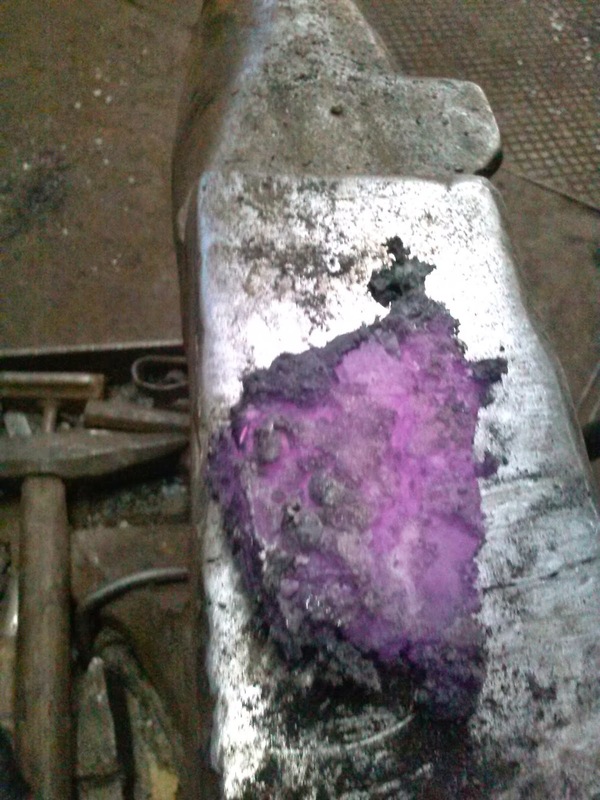 The idea is you can build a fire in a furnace, chuck in all of your iron scraps that are too small to forge-weld together and semi-melt them into a porous cake. Think like a scone, kind of. There are many small furnaces that have been excavated across the Indo-European sphere of iron-working which were too small or temporary to accommodate full-scale reduction of raw ores into iron. Other archaeological evidence and some primary accounts indicate that nails and other scraps were compiled and slowly fed to the furnace, consolidating into a cake that can be forged into a bar. The other purpose of hearth-melting is to change the chemical makeup of a batch of steel. 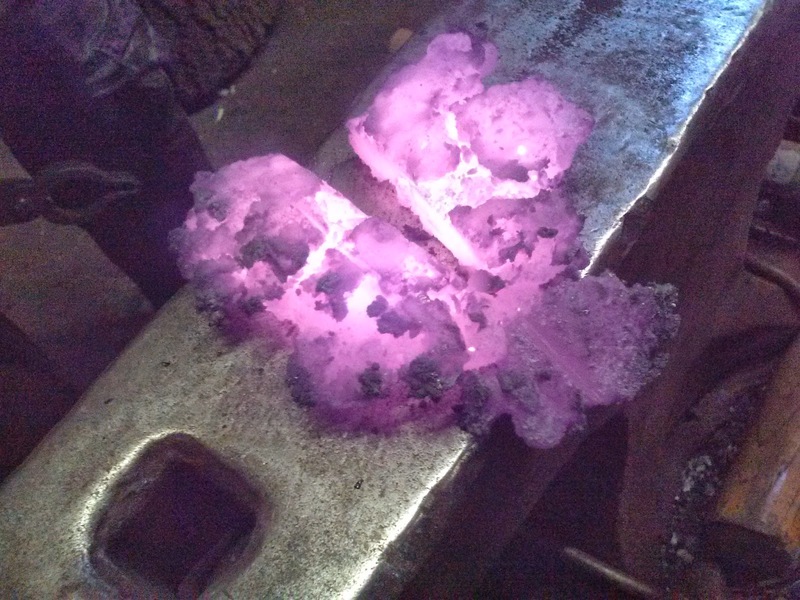 There in the furnace at temperatures between welding and melting, where fundamental bonds dissolve and form in a whirlwind dance of elemental cataclysm, iron, carbon, oxygen and other ingredients strap together and tear apart. The product of this storm is determined by overall mixture of fuel and air, temperature and time. The fuel is charcoal and the air is forced into the side by bellows or blower, though a slanted pipe called a tuyere. 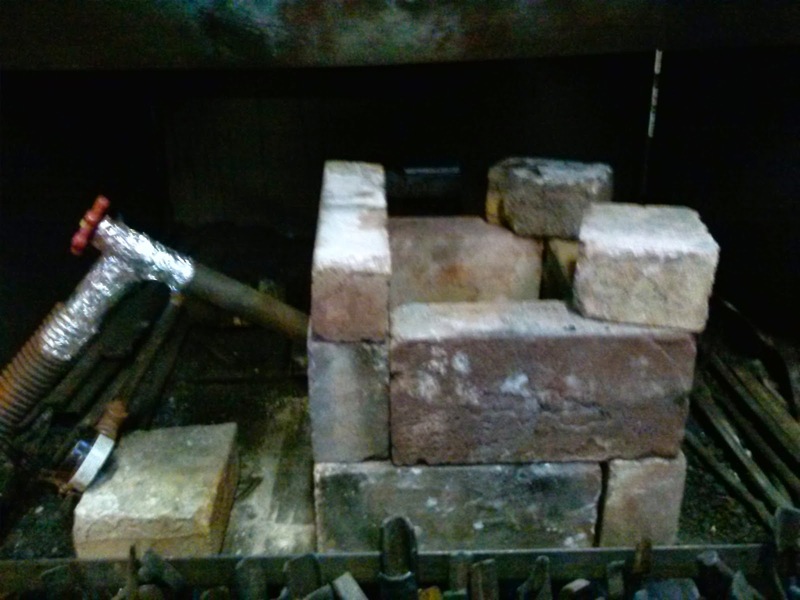 We built our furnace out of easily-disassembled firebricks under Jack's coal-forge hood. There was a bed of ash inside it and a hole in one of the bricks for the tuyere to poke though. We built a fire with wood and then started piling on the charcoal once it was going. After that, we started adding our scraps piece by piece. 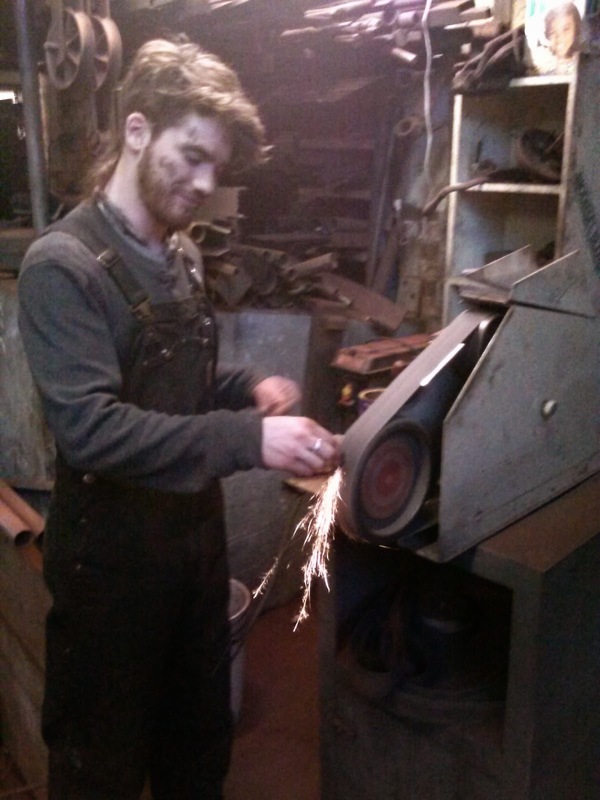 Mostly we had broken up old saw blades, pitchfork tines, and other pieces of formerly high-carbon steel. It was sort of an experiment to see how high-carbon our product would be if we used high-carbon source material, but our conclusion was that the environment of the fire mattered more than the material. So, once we figured we had loaded enough source material into the furnace that we'd accumulated a good amount of mushy iron batter at the bottom, we stopped adding charcoal and let the fire burn down a bit. We removed bricks from the side and dug out the little cake. Jack handled it with tongs and laid it on the anvil, and I slammed on it with the sledge. We had to be a little bit careful because what comes out can be brittle and portions of it can crumble off. The most troublesome part is getting the extremities to weld on; usually they cool too fast to do that. But we've learned that there's a significant amount of material loss, and the best thing to do is just re-melt whatever falls off. 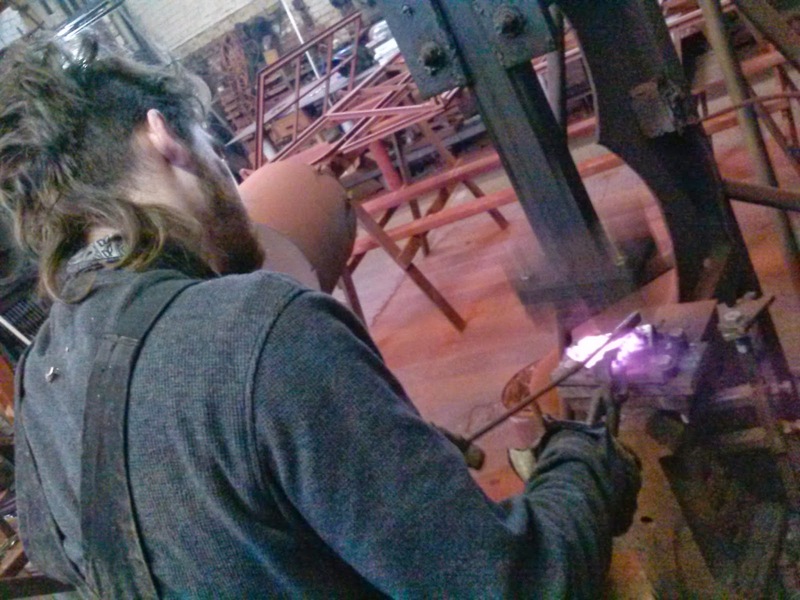 After we'd manageably flattened our little steelcakes, Jack cut them in half on the power hammer. The idea was to expose the interior of the puck so we could spark test the carbon content on both the exterior and interior of the puck. We also split it up so we'd have more pieces to layer and fold, in order to better homogenize the material. Good thing we did that, because the steel we made ended up being incredibly non-homogenous. The spark test showed very, very high carbon content on the outside of the puck and surprisingly rather low on the inside. That probably meant that fire was hot and oxidizing enough in places that the carbon burned out of what we put in, especially in the material that remained in the furnace for a time and became the center of the cake. However, the extremely high carbon casing indicated that there was a significant amount of carbon migration into the material from the charcoal fuel. The fact that it was not very deep illustrated that carbon can saturate iron to make a very high-carbon jacket, but penetration depth takes a significant amount of time, perhaps at lower temperatures so it is not also burning off at the same time. 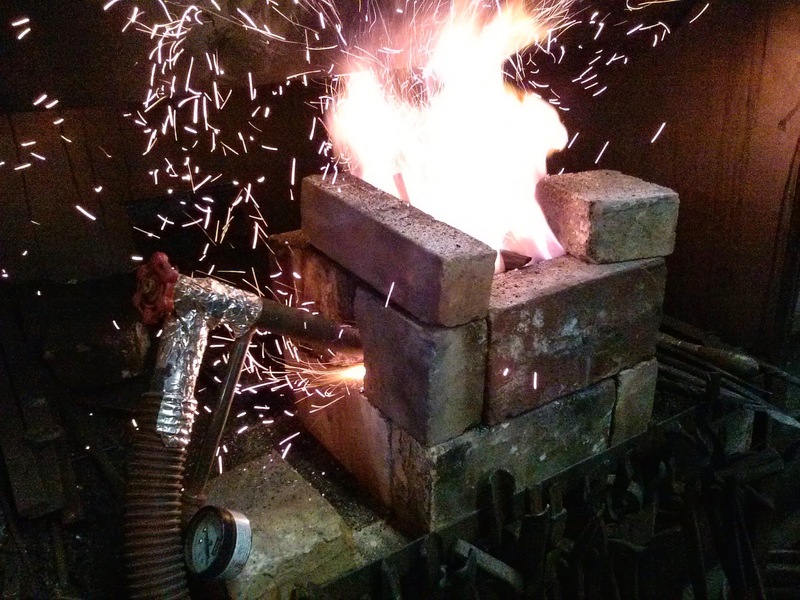 Either way, that is how we concluded that regardless of the carbon content of the starting material, most of it burns out due to the extreme heat and oxidation, and any carburization that happens is the result of cementation from the charcoal. Either way, it might follow to use higher carbon stock anyway, simply knowing that it will melt faster and more fully (more carbon means a lower melting temperature; castable iron is around 4% carbon and utterly unforgeable; malleable wrought iron has almost no carbon and takes very extreme temperatures to melt). The other variable we did not experiment with or research much was the shape of oxidation and reduction zones in the furnace as determined by tuyere height and angle. That we'll have to save for the future. As it stands now, I have a few small cakes of homemade steel to play with, and there's challenges ahead but lots of promising and exciting work to do!